Turned into tetractyses, the 16 triangles contain 60 hexagonal yods consisting of the 16 brown hexagonal yods at their centres and the 44 hexagonal yods on their 22 sides (see diagram above). As four of these sides are sides of the sectors of the two hexagons belonging to the inner Tree of Life, the outer Tree of Life has (22−4=18) sides with (18×2= 36) green hexagonal yods that are unshared with its inner form as hexagonal yods, as well as (4×2=8) white hexagonal yods that are shared. 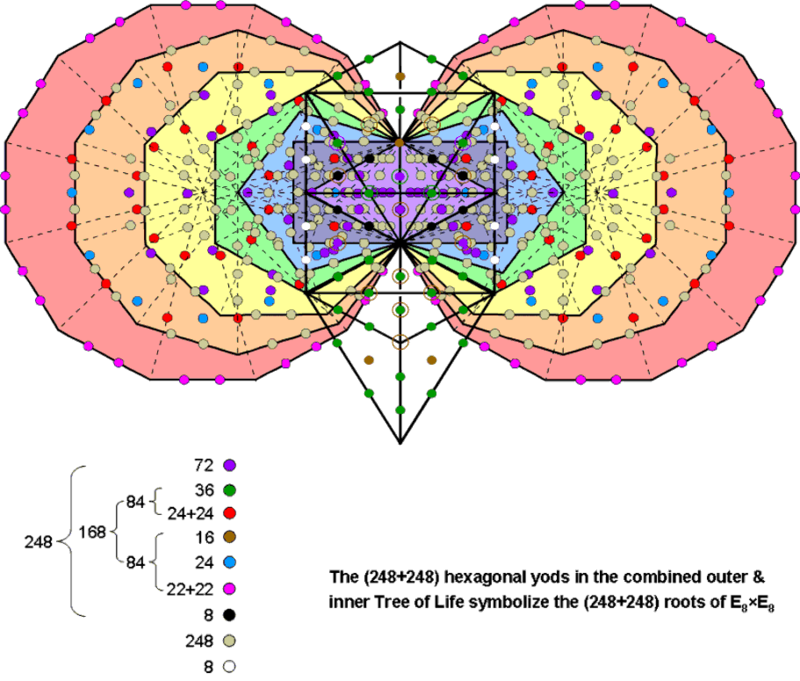 Hence, the outer Tree has (16+36=52) unshared hexagonal yods. 52 is the 26th even integer, showing how YAHWEH with number value 26 determines the population of hexagonal yods that are intrinsic to the outer Tree. The two hexagonal yods on the Chesed-Geburah Path are the centres of the two violet triangles belonging to the (7+7) enfolded polygons, so that they are corners of tetractyses belonging to the latter. This means that 50 of the 52 hexagonal yods intrinsic to the outer Tree are hexagonal yods from the perspective of both Trees, showing how ELOHIM, the Godname of Binah with number value 50, prescribes this property. = (70+2) + 24 + 22 + 24 + 22 + 24 + 256. When the outer and inner Trees are combined, the eight white hexagonal yods on the two side pillars of the former coincide with some of the hexagonal yods in the two hexagons that belong to the latter. It was found above that there are 52 hexagonal yods in the outer Tree that are unshared as such with the inner Tree. The number of hexagonal yods in the combined Trees = 52 + 444 = 496. This is the dimension of both E8×E8 & SO(32), the two symmetry groups that govern the anomaly-free interactions between heterotic superstrings. 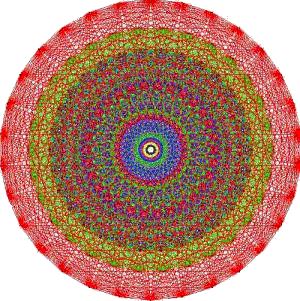 This property constitutes amazing evidence for the Tree of Life basis of superstring theory because, although it might be coincidental, only the most extreme debunker would be willing to consider this a plausible possibility, especially given the additional properties of this number embodied by the combined Trees of Life to be discussed next. 496 = 52 + 444 = (16+36) + (70+2) + 24 + 22 + 24 + 22 + 24 + 256. = 8 + 72 + 84 + 84 = 8 + 72 + 168. We find that the hexagonal yod population 496 splits into 248 & 248′. This is analogous to how the dimension 496 of E8×E8′ is the sum of the dimension 248 of E8 and the dimension 248′ of E8′. That the geometry of the combined Trees allows such a natural splitting of this number into two equal numbers is evidence that it is not by chance that they have 496 hexagonal yods. This conclusion is confirmed by the fact that the number 248 further divides naturally into the number 8 denoting the eight simple roots of E8, the number 72 denoting the 72 roots of E6 (an exceptional subgroup of E8) and the number 168 denoting the 168 remaining roots of E8. 168 further divides into two equal numbers 84 (the diagram in #23 shows that the 168 8-tuples group into (56+28=84) 8-tuples and (3×28=84) 8-tuples). This bifurcation is displayed in all the sacred geometries/holistic systems discussed in this website (see here under "168 = 84 + 84"), as is the 72:168 division (see here). Amazing though it may seem, what we are encountering here is not the highly improbable result of miraculous chance but the manifestation of the group mathematics of heterotic E8×E8′ superstring theory in the sublime sacred geometry of the outer & inner Trees of Life. 168 roots → (36+16=52) brown & green hexagonal yods in the outer Tree of Life unshared with the inner Tree & (24+24+24+22+22=116) red, blue & pink hexagonal yods in the two dodecagons outside the root edge. E8′ ↔ 6 Sephiroth of Construction above Malkuth. It would indicate that the symmetry group E8 applies to the forces operating in the familiar, physical universe of ordinary matter, namely, Malkuth, and that E8′ applies to forces operating in a more subtle (although still physical) universe. This is what superstring theorists have called the parallel universe of invisible "shadow matter" that is separated from the ordinary universe by a narrow gap extending along the seventh compactified dimension predicted by supergravity theories. This type of matter is sometimes confused by popular science writers with "mirror matter" — hypothetical particles that are the mirror images of the known subatomic particles. Although shadow matter is similar to this parity-reversed form of matter in not strongly interacting with ordinary matter, it is otherwise completely different, quite apart from being a rigorous, mathematical prediction of E8×E8 heterotic superstring theory and not just an ad hoc theoretical speculation. 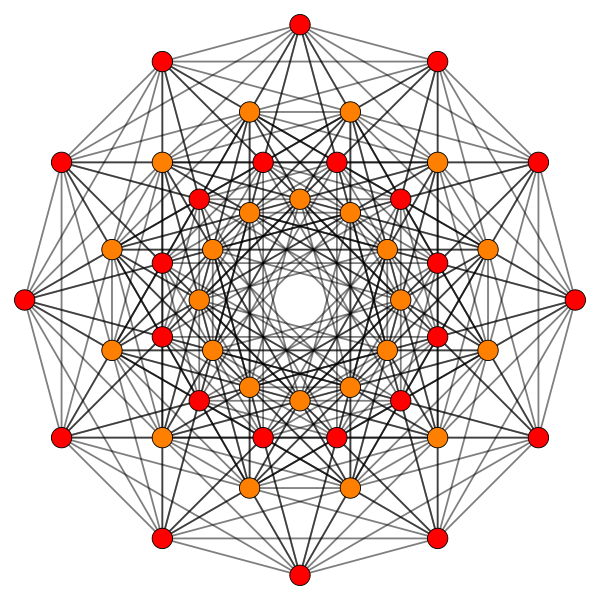 The fact that the hexagonal yods symbolizing the roots of E8′ are distributed differently from those denoting the roots of E8 indicates that the break-down of E8′ symmetry proceeds differently from the break-down of E8 symmetry. The properties of the combined outer & inner Trees of Life are analyzed in depth in Article 54.